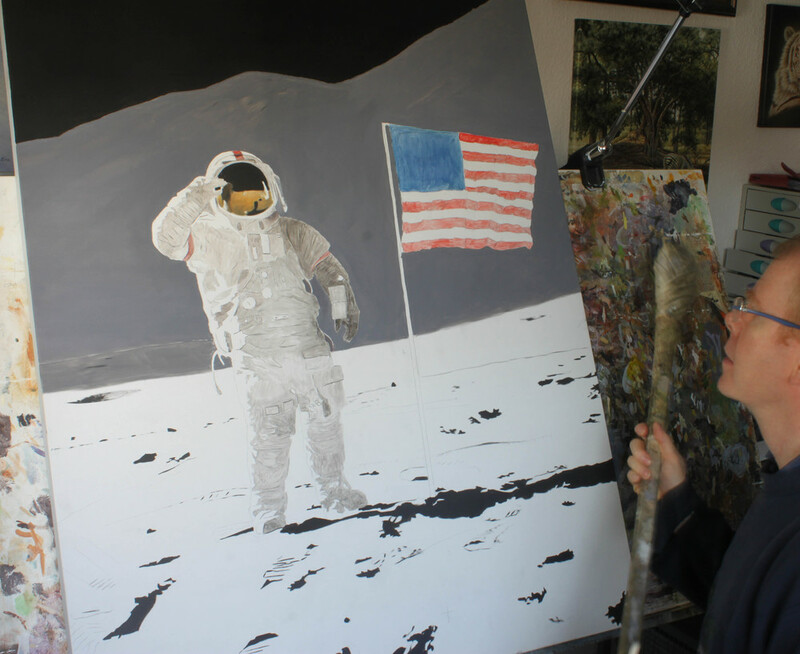 'Man Must Explore' - Painting Commander Dave Scott. Apollo 15. 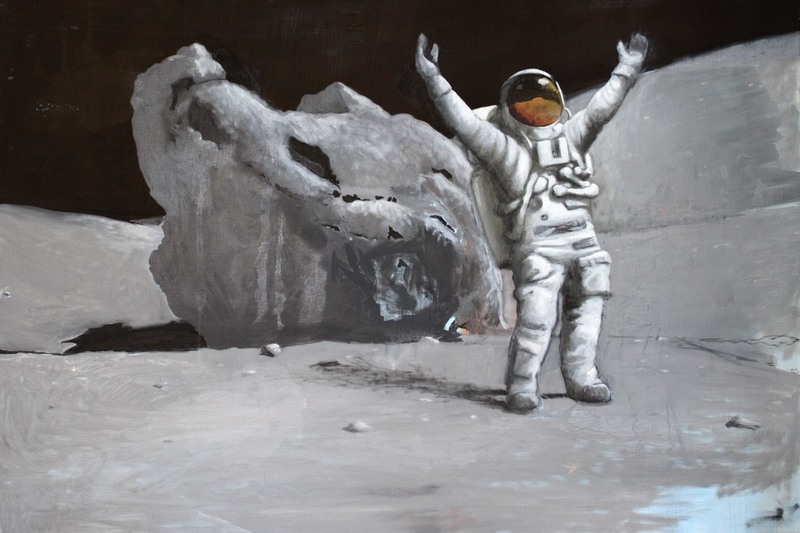 I've had a lifelong interest in Space Exploration, and every once in a while I feel the urge to paint something that truly fills me with awe: The Apollo Moon Landings. 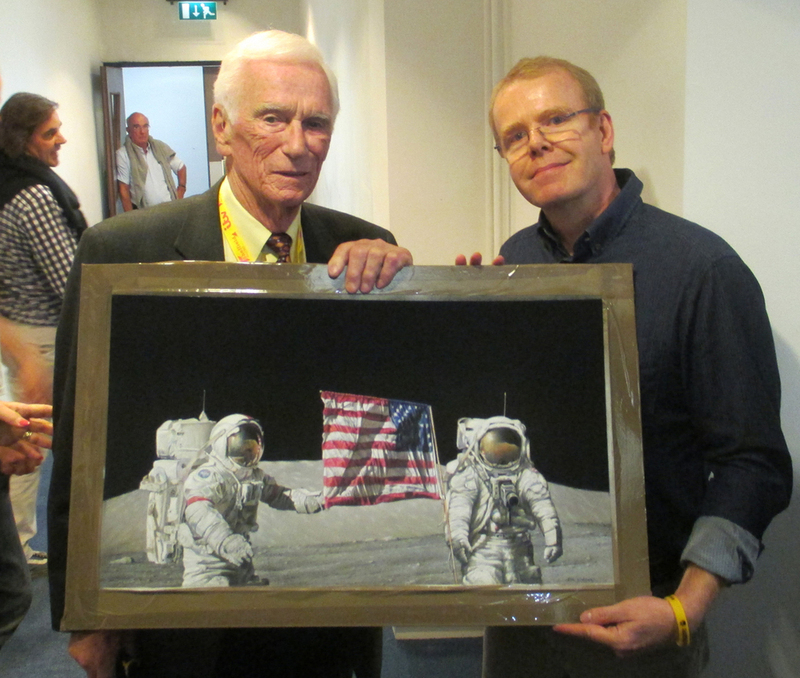 In 2014 I was lucky enough to meet Captain Eugene Cernan, the last man to walk on the moon. I can't describe what that meant to me. It meant so much and needless to say I left feeling inspired and with a burning desire to paint an Apollo painting on a grand scale. 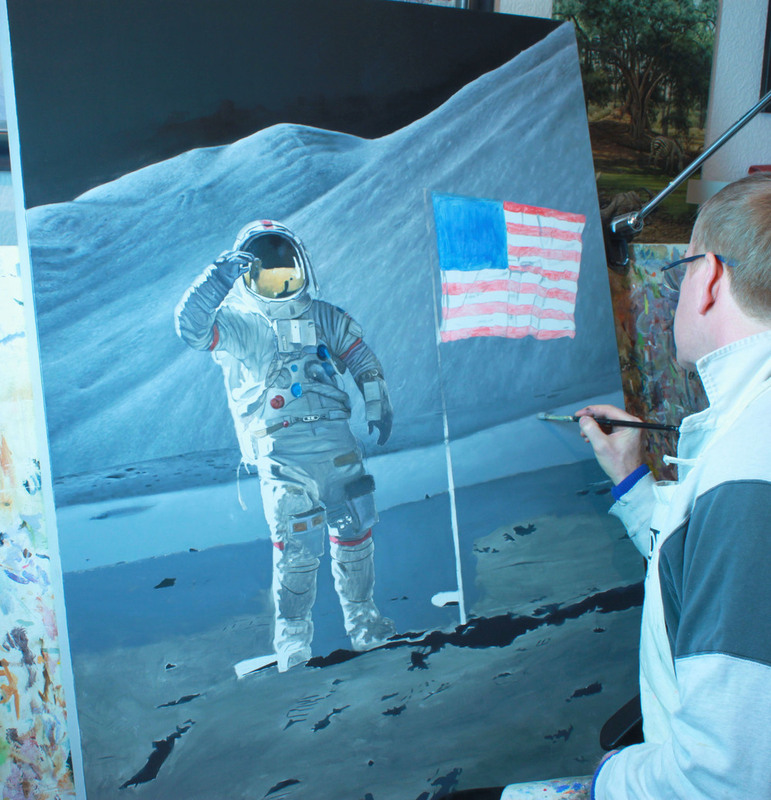 I had a lot of ideas floating around in my head, some I quickly sketched out in oils to see if they would work such as this one of Charlie Duke of Apollo 16, and the other of Eugene Cernan Apollo 17, but in the end I decided to stick with absolute historical accuracy, at least for my first major Apollo work. My plan was to sift through the many thousands of photographs the astronauts brought back from the moon and to see if there was anything I could enhance, and in doing so, add to the wealth of accurate imagery that Apollo gave us. I wanted accuracy, but I didn't just want to recreate an existing photograph. I wanted to make something that was unique. I was very impressed by a series of photographs taken during the Apollo 15 mission at the end of the second EVA. 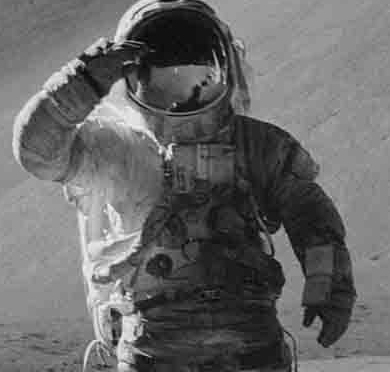 ( Extra-vehicular-activity ) These were exactly what I was looking for because they were taken in black and white and were quite grainy. What if I were to add the colour and the clarity to one of these images? ..or to part of one? 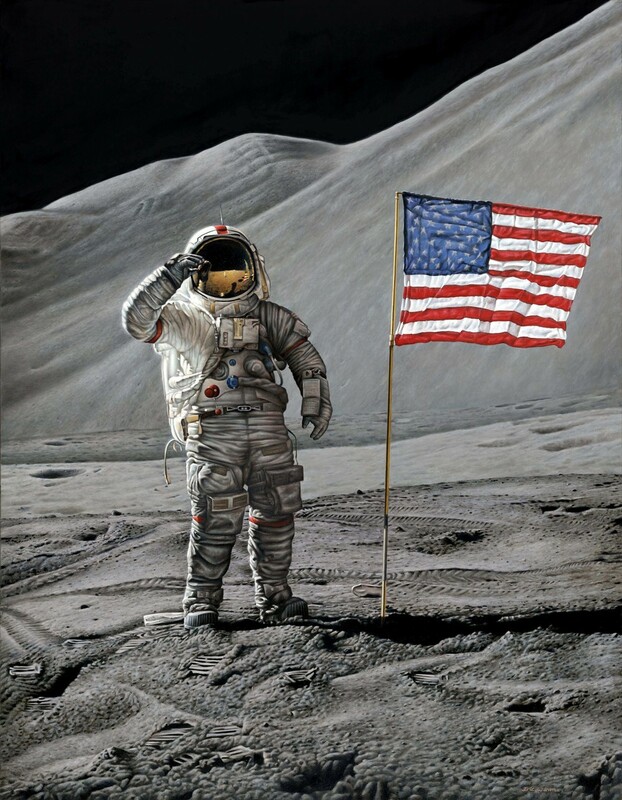 I really liked this picture cropped to show just the astronaut and the flag. I thought it was a very powerful stance Commander Scott had adopted, making him look almost like a superhero, and I loved the back lighting on his suit and the flag. All I needed to do now was to do justice to this historical moment by adding colour and the detail that is missing in the photograph. It's harder than you might imagine to make sense of an Apollo space suit, and to be sure that you have everything exactly as it was at that moment. I spent as much time if not more, pouring over photographs of Commander Scott's space suit than I did painting, to make sure I had everything exactly right. It was a labour of love. I hope I have done Commander Scott justice with my painting. I was 11 years old when he made his epic journey to the moon. I am as awe struck today as I was back then. What I would give to have seen what his eyes have seen. The Apollo Astronauts are to me, the greatest of heroes. Remarkable men who did extraordinary things in a time when humanity dared to dream of a bright future. 'Eric, Your painting is exquisite. It captures the essence of exactly like it was – the shadows, the wrinkles in the suit, the flag, the mountains, the footprints –all take me back to a place I used to call home'. I am deeply grateful for those words. Nobody has spent more time on the moon than he has. I could not imagine a better endorsement and confirmation that I succeeded with my painting. I will leave you with some photographs of the work as it progressed, and with the words Of Apollo 15 Commander Dave Scott himself, describing his feelings upon returning from the moon. Oil on Belgian Linen. 45 x 35 inches.